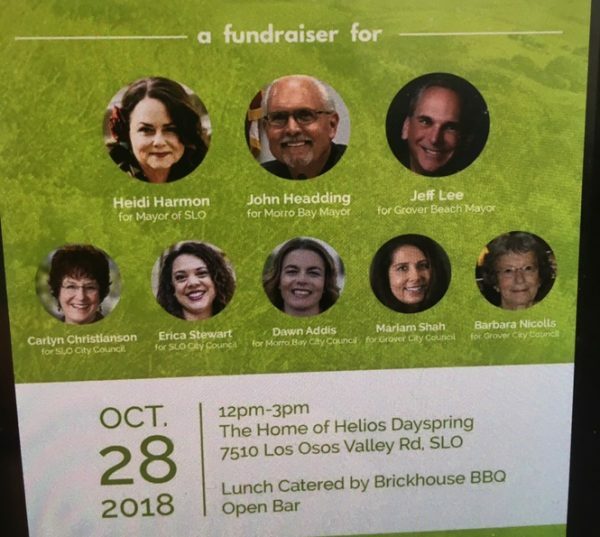 On Sept. 30, 2018, Dawn Legg, a liaison for PG&E and Supervisor Adam Hill’s planning commissioner, spent $1,500 on a fundraiser she hosted for Harmon, Christianson, and Stewart. However, none of the candidates claimed the contribution on their financial disclosure forms. Right or left does not matter, we need public officials who follow the law and properly report donations. Also, the SLO City attorney is not supposed to spend her time on election issues. But with a council that ignores the law, I guess there is little chance they will call her on the carpet for using public resources to work on their election issues. It is time to clean house. Well it only works if the corruption that is uncovered is among conservative politicians and carbon producing corporate businessmen. Corruption among progressive politicians and the new darlings of capitalism, weed dealers, or “purveyors of magical herb” as they prefer to be known, is non existent. After all, how can the most “enlightened” and “caring” among us be corrupt? So reporters work to hold government accountable, the job of the media, and attorney James Wagstaffe battles to protect the law breakers. Threatening reporters to protect public officials from scrutiny. What a scumbag!